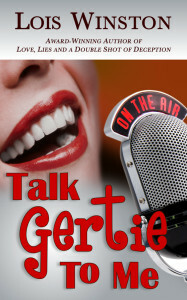 I just love the clever title of this romantic comedy by Lois Winston, Talk Gertie To Me. 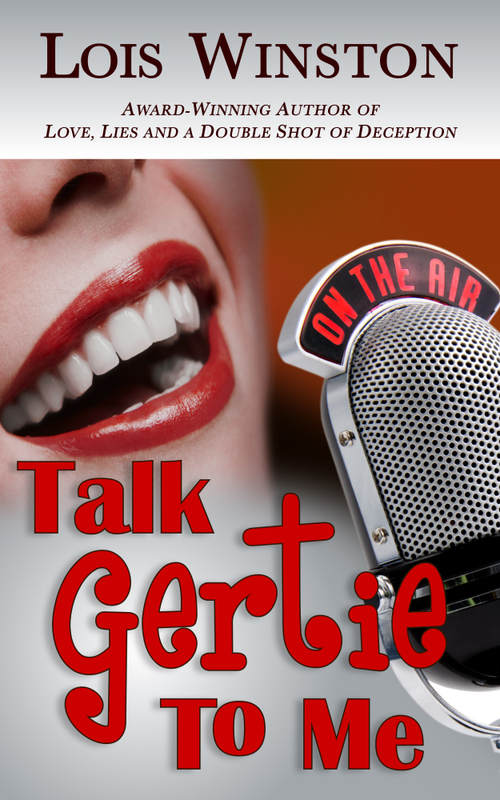 And you will never guess who Gertie is! Read on…. On the worst day of Nori Stedworth’s life, she first discovers her BFF naked in the Jacuzzi with her two-timing louse of a boyfriend. Then she finds her mother, along with several suitcases, camped on her doorstep. Finally, she learns she’s lost her job. With her imaginary friend Gertie in tow, Nori escapes to a neighborhood coffeehouse to lick her wounds over a cup of latte she can no longer afford. I yanked open the door of Bean Around the Block and headed for my favorite table. It was taken. By a young couple making goo-goo eyes at each other over steaming cups of cappuccino. “Figures,” I muttered, searching the room for another seat and finding not an empty table in the place. The normally quiet café was filled with chattering strangers who nearly drowned out the Wynton Marsalis piece playing in the background. But I headed for the hunk’s table and planted myself in front of him. Okay, so Gertie knew cute. I couldn’t fault her on that. But then again, under the circumstances, wouldn’t Gertie define cute in the same terms I did? “Do you mind?” I asked Cute Guy, AKA Tall-and-Lanky-with-a-Shaggy-Crop-of-Chestnut-Hair-that-Fell-Over-One-Eye-Guy. “Hmm.” He dropped his gaze back to his computer screen. End of conversation. I sat down and deposited my laptop on the table opposite his, flipped it open, and powered it up. “Cute but uninterested,” I told Gertie. I signaled Amber, one of the two regular evening waitresses. She paused for effect but didn’t stop hopping up and down on the balls of her purple Nike-clad feet or flapping her arms like some deranged canary. She held her breath, waiting for me to respond. “There goes the neighborhood,” muttered my table mate. He grunted his lack of enthusiasm over the idea and went back to typing. “Clever,” muttered the Cute Guy, AKA Mr. Randolph, although I was beginning to think of him as Grouchy Cute Guy. “With a C, not a K,” he added in deadpan, not bothering to look up. “Right.” Grouchy Cute Guy shook his head and chuckled as Amber stuck her tongue out once more before heading toward the coffee bar. I started typing out my frustrations, listing all the wrongs that had been visited upon me over the past eight hours and trying my damnedest to put a positive spin on the events. Wallowing in self-pity wasn’t going to get me anywhere. How will Nori and Gertie get Grouchy Cute Guy’s attention? Visit Lois Winston’s websites and click on her buy links below to learn more about her and her characters.